Review: A getFITkit to Track Your Progress and Reach Your Goals! A getFITkit to Track Your Progress and Reach Your Goals! When you’re getting fit and trying to lose weight, you want to be able to track your progress without going totally crazypants. You want to know how you’re doing, what changes are going on with your body (sometimes it’s hard to see it on ourselves so we need numbers to confirm it!) and how you’re progressing. But, you don’t want to get obsessive about it or feel like your entire happiness is based on the number on the scale (let us say it again: you are MORE than that number!). But this new getFITkit we were sent from fitlosophy to review? Well, it’s pretty brilliant. 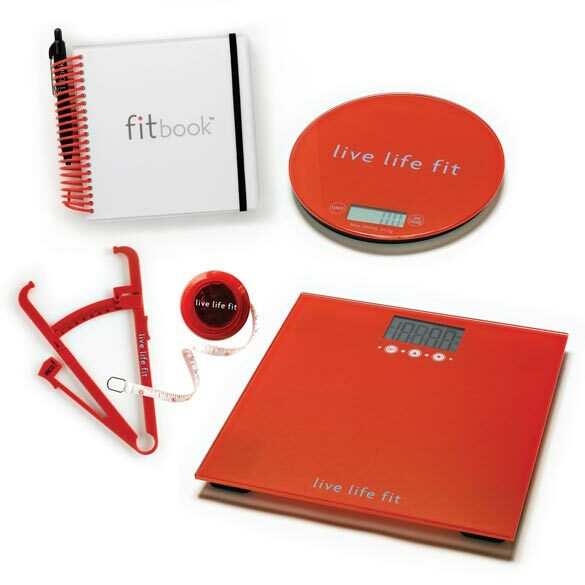 The kit comes with four items: a goal weight body scale, a fit tools kit, a digital food scale, and a fitbook fitness and nutrition journal. Now, we’ve already reviewed (and loved) the fitbook and the digital food scale (reviews can be found here and here), but this was our first time playing with the body scale and the fit tools. And besides being really cute and red and fun, they’re quality — and incredibly useful. The goal weight body scale is darn amazing. Similar to this scale’s concept, it focuses more on your goal rather than a number. You simply set your goal weight (it can track up to 10 peeps), and then you weigh in weekly to see if you’re making progress to your goal weight. As you step on the scale, it lights up with a color — purple, blue, green, yellow, red — which indicates if you’re beyond your goal, at your goal, making progress or are going away from your goal, along with a number of how much you’re over or under (or at) your goal. No drama, just a color and reference point to let you know how you’re doing. Then, there’s the fit tools kit. We all know that getting healthy is about more than just the scale — and if you’re working out and building muscle (hooray for you! ), what you really want to see is if the inches and actual fat are coming off. Not just that you had a massive poo. So the body fat calipers and body tape measure in the fit tools kit are awesome for just that. It even comes with a guide to show you how to measure yourself and how to track your progress. Again, not about the obsession; it’s about tracking your changes in a sane way that makes you feel good about your progress. The whole getFITkit she-bang goes for about $100, so it’s a bit of an investment. But, when you think about it, for well-designed tools that actually monitor your health in a supportive, real way? Well, we think that’s worth it. And we dig the red. This looks really neat! I have a inexpensive scale I bought about a year ago, which I have been thinking of upgrading for one that actually tracks your progress. I also have tape measure, you know the big yellow one you can pick up at a fabric store. But I have to admit I am not even entirely sure I have been measuring myself properly. I also use a pedometer app on my iPhone that allows you to enter measurements to track your progress, which I really like.